Full Circle has been blogging some great recipes lately. This is the second one I've tried in the past week and it was good enough that I had to blog about it too. I'm always looking for different recipes to try with my Full Circle greens and this one looked too good to pass up. Michelle, the author of Daily Waffle, had her recipe reposted on Full Circle's blog for Cajun Inspired Stuffed Collard Rolls. 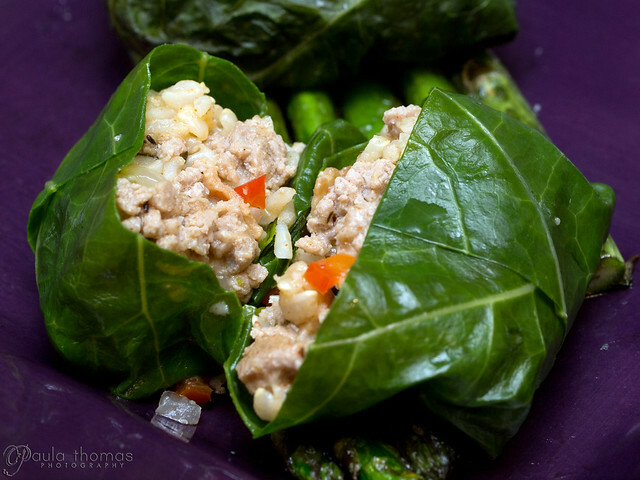 Her recipe was inspired by Sunny Anderson's Pork-Stuffed Collard Greens recipe. I gotta say Michelle's version of these rolls looked much more appetizing than Sunny's based on the photo. So, I figured I'd continue the chain and share my own version of this recipe. I pretty much followed Michelle's recipe and didn't even look at Sunny's but I swapped out a few ingredients and omitted some and I couldn't have been happier with the results. My changes to Michelle's recipe inclue using brown rice instead of white (I guess she doesn't really say what type of rice but I assumed white), using ground turkey rather than pork and omitting the tomato and cider vinegar. I also increased the amounts of collard greens, bell pepper, garlic, cayenne, thyme, rice and broth which produced 9 rolls instead of 6 with some stuffing left over which I put in the freezer. Preheat the oven to 375F. Rinse collard greens and remove stems. Blanch the leaves in lightly salted boiling water for 2-3 minutes until softened. Drain and cover with cold water and ice to stop them from cooking. In a large skillet, render the bacon over low-medium heat. Add the peppers, onion and garlic and saute until softened. With a slotted spoon, transfer mixture to a bowl and set aside. In the same pan, brown the ground turkey over medium heat. Drain off excess fat. Add back the bacon and pepper mixture. Mix in cayenne, thyme, paprika and rice and cook for 5-7 minutes. Season with salt and pepper to taste. 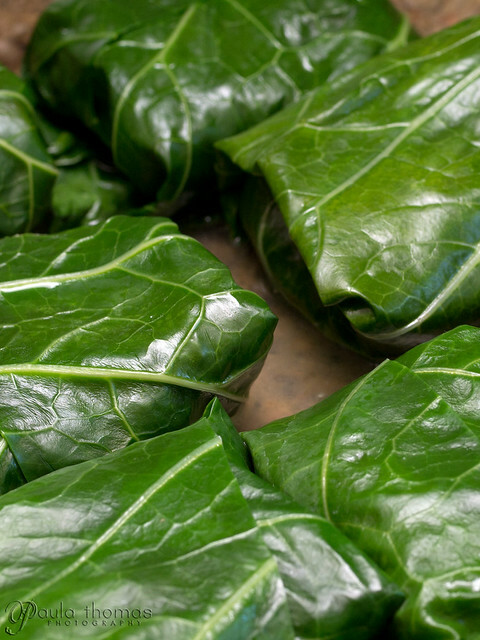 Depending on the size of your collards, put 1/2 to 3/4 cup of filling near the top of the leaf, tuck in the sides and roll it like a burrito. set the rolls into a baking dish, seam side down. Repeat until all collard leaves are filled. Add 3/4 cup chicken broth to the baking dish and cover with foil. Bake for 30 minutes. Very interesting recipe. I think I'll try it. I just harvested a bunch of collard greens that were hogging the sunlight of other plants. I also saw Sunny Anderson's pork stuffed collard picture and I think it looked quite...gross. I like her collard green pesto and was hoping to find another great collard green recipe alternative to southern style collards.